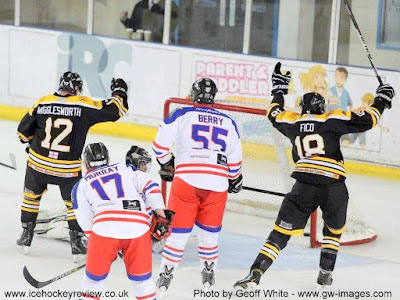 Widnes Wild made the short journey to Altrincham on Sunday securing a great win thanks to five unanswered goals after going two goals down in the first period. The Altrincham Aces started strongly when Jared Dickinson put the Aces in the lead after four minutes with a rocket of a shot from the blueline. Five minutes later the Aces scored their final goal of the game when a clinical pass down the centre of the ice to Jaroslav Kucej enabled him to breakaway and beat Wild goalie, Greg Ruxton, in a one-on-one contest. Despite increasing Wild pressure they were unable to find the back of the Aces net and the period ended with the home side enjoying a two goal lead. It took eight minutes into the second period before the Wild scored the first of their five unanswered goals when Scott McKenzie won a faceoff in the Aces zone and then quickly passed to Geoff Wigglesworth who slotted the puck into the Aces net. The Aces then weathered a storm of Wild pressure before Wigglesworth added a second Wild goal with two minutes left in the period. The Wild equaliser spurred the Aces into action however the Wild defence was able to neutralise any threat and the period ended with both teams tied on two goals apiece. On the third minute of the third period, the Wild fans saw the team take the lead for the first time thanks to a spectacular goal from David Swanston, his first in a Wild uniform. The Wild taking the lead saw the intensity of the game soar and the Aces lose their composure leading to the Wild’s Scott McKenzie being able to find the back of the net for the Wilds fourth goal. Three minutes later the Wild lit the lamp for the last of their five unanswered goals when George Crawshaw took advantage of a Shaun Dippnall inch perfect pass, underlining the Wild dominance and giving the huge Wild travelling support an early Christmas present in the form of 2 points and second place in the league.